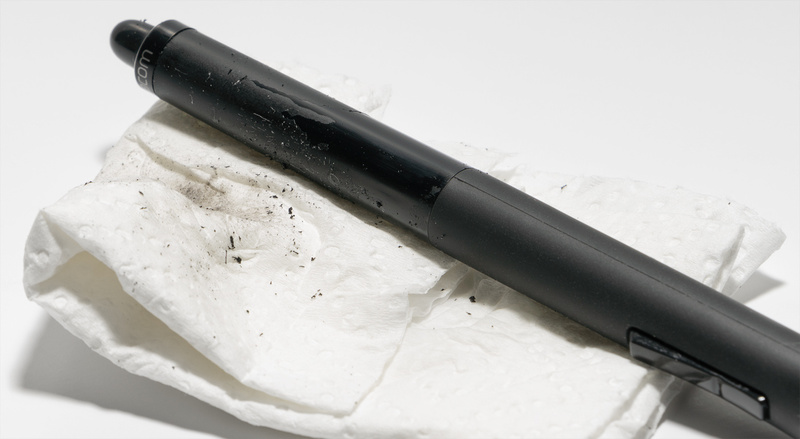 I have no idea how this happened, but seemingly overnight the rear half of my Wacom grip pen got super sticky. It felt like the same kind of residue left behind when you unsuccessfully peel a sticker off something. I did not spill anything on it or use it with dirty hands. It was (and I guess still is) so puzzling to me. First thought was to get this grossness washed off. But surprisingly the same cleaning stuff I'd normally use to get the sticker residue off of something didn't work on the grip pen. In fact, the cloth I was using to clean it just made it worse by gunking it up with little fibers. Ugggghh. Gross sticky gunk on the eraser half. After searching online for an answer I came across a couple other people with the same problem. There's speculation on humidity, oil from your fingers, and some kind of plastic decomposition. I don't know. Strange stuff. But I did find the solution to getting it removed: 70% isopropyl alcohol. As you can see from the image below, cleaning with the alcohol takes off this gunk in little black flakes. Even with a cleaner that finally worked, it took a decent amount of scrubbing for it to be fully removed. And it makes a mess. Stickiness partially removed. You can see the clean shiny plastic coming out from underneath. I'm sure this post might not be of use to many since this seems like a rare occurrence, but maybe it'll stick in the back of your head if you ever run into the same troubling issue I did. Sure beats spending $65 on a new grip pen. Does anyone have any idea what caused this in the first place? Or why it was the isopropyl alcohol that did the trick but not other stickiness cleaners? Back to normal. Whew. No way I want to live in a world without my Wacom. I have the same problem with my pen too. That part is nasty. Luckily, I really don't touch it that often. Did you leave the pen on the tablet when this happened? No, it was placed back in the pen stand. well there goes my theory, I had the same thing happen to me. The plastic is breaking down. For the same reason old toys leech fluid or get gummy - any women here have Barbies from the 80s? There's no good fix that I know of. Time to say goodbye and get a replacement. BTW, this just happened with the grip on my Canon EOS SLR... it seems to have stabilized now, but if it gets any worse, I'm gonna have to get handy with some leather. Well, like I said the 70% isopropyl alcohol took care of the gunk and looks good as new now. I'm not sure if it will return and how long it will stay non-sticky if it is a old cheap plastic issue, but seems like a good solution if it happens. I am sort of confused as to what the abundance of black flakes coming off is, but as long as it still works and doesn't feel disgusting using it I'm okay. No replacement needed yet. Toothpaste will actually fix this. Worked....thanks for uploading the fix....lets hope it doesn't happen to the rubbery piece close to the nib. Same thing happened to my Art pen, but nothing to the regular grip pen or the classic pen yet. The ironic thing is, all three pens are stored in the same location in their stands, very odd how the Art pen has done it. Anyway before discovering this post I tried olive oil, no luck with that, tried scrubbing, but the tackiness started coming back, so a temporary fix I have done for right now is applied some heat shrink tubing (be carefull on the heat) Pen works ok but the weight of the pen now feels a little tail heavy. I'm thinking maybe I had some Deet residue on the back of my hands one day. That stuff as you know comes in most mosquito repellents, I have seen it do a similar thing to a plastic clipboard. That is the only theory I can come up with right now. I started using a glove a while back to ease with drawing on the Cintiq 22HD Touch and not registering my palm. Anyway I don't use the art pen very often, I normally use the classic as it is closer to a "normal" pen for size and feel; however it doesn't register barrel roll like the art pen does. Hope this helps some people. I had the same problem too. And also on another's manufacturers mouse. I tried the isopropyl tip and it didn't work. But I found that Methylated Spirits did work. Both pen and mouse are now as new. The problem is due to the type of plastic used where the components separate out due to faults in manufacture, and is not caused by any contamination from your hand. On the mouse it was still in its unopened box and had never been used. And the affected pen had little use too. 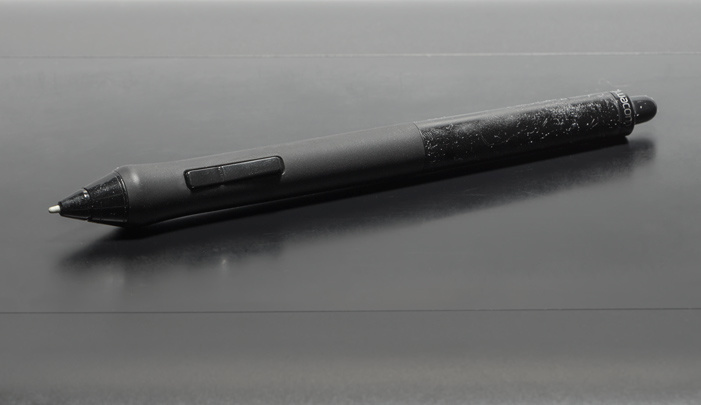 I have two Intuos-3 PTZ-630 tablets and the soft rubber grip on both pens have gone sticky within a week of each other. They are the same age! It's unpleasant to use, and is unlikely to magically go away. Thoroughly checking Wacom's site, it doesn't look like it's a replaceable part. New pens are one solution, but an expensive one especially as I'll need two. It would be great to hear a solution to this. I have several Wacom pens and this happened to the older ones but not the newer ones, I think the rubber is decomposing or it was a bad batch or it reacts to something. I didn't have any of the 70% isopropyl alcohol on hand but the toothpaste suggestion worked just as well. A small dab of toothpaste and paper towel is what I used. First I rubbed the toothpaste around the centre of the sticky part by rotating the pen and I slowly moved away until the smooth plastic returned. Thanks for posting a solution, I almost bought a new pen and it costs $100 here in Canada. It's not as shiny as Ryan's photo, but it is nice and smooth and if I remember what it looked like before, it's a nice matte black finish. For anybody curious what the inside of your stylus looks like. The pen itself is made up of four big pieces that I saw after dismantling my pen to figure out if it was replaceable. The end that has gone sticky is what holds the electronics within the pen. After removing the tip, the rubber grip, the button piece will then simply become loose. The main body is made up of two pieces, one that holds the board and the main shaft that covers it up. You can tug the main shaft with a little force and it will pop loose with a click. If you're doing this be careful, it looks pretty fragile especially the tip area that holds the nib. It's actually held together by a very tightly bound thread around a metal tube that's attached to what I assume is what triggers the pressure sensitivity when you press down on the tip. Other than that, not much else. It's pretty interesting to see how they made the stylus. I clean such things with "Sidol-Kunststoff-Spray". It's a special plastics cleaner. I also clean my mouse and other things with this cleaner, because it removes all kind of dirts but not destroy the plastics. I just unboxed a Wacom Bamboo purchased for my kid (never used it) several Christmases ago and encountered the pen gunk. I read the posts, looked for the isopropyl, couldn't find any, so I grabbed a bottle of mouthwash and a paper towel: Instant success! It took all of five seconds. No muss, no flakes, sticky is gone, no gunk on the towel. I'm gonna try the same thing on my Stihl Trimmer, which has the same condition. Thanks for the tip! 99% isopropyl alcohol worked perfectly for me. Thanks for posting this solution! The reason I have isopropyl alcohol on hand is for sticky camera shutter buttons. I first used it on my old Canon 40D and them on my sons Fuji X100T shutter button. It also helps with sticky dials on the Fujis. Thanks again for the 'magic' fix for my Wacom pen pen! I have no idea what causes this, but I've experienced this with the Wacom Grip pen, Staedtler Remedy pencil, and many other pens. The rubber/plastic(I have no idea what it is chemically) can randomly start being sticky and gross. Using isopropanol (99%), naphtha, or other various solvents usually works wonders. I use a microfiber cloth to rub the solvent on and the gunk off. BTW, this also happens to pens that I've had in storage, so it seems to be a time based reaction rather that use based.